Heat oven to 400°F. In medium bowl, stir 1 cup flour, 1/2 cup butter, 1/4 cup sugar, 1/2 teaspoon cinnamon and the egg yolk until mixture forms a ball. Pat about two-thirds of the dough on bottom only of 10-inch springform pan (with side removed) to make bottom crust 1/8 inch thick. Bake 8 to 10 minutes or until crust just begins to brown around edge. Reduce oven temperature to 300°F. Attach side to pan. Pat remaining dough about 1 inch up inside of pan. In medium bowl, beat sweet potatoes, 1 tablespoon butter, 1 teaspoon cinnamon, the nutmeg and vanilla with electric mixer on low speed until blended; set aside. In large bowl, beat cream cheese and 1 cup sugar on medium speed about 1 minute or until smooth. Beat in sweet potato mixture on low speed about 1 minute or until blended. Beat in eggs, one at a time. Spoon batter into crust in pan. Place springform pan in larger pan on oven rack. Pour very hot water into larger pan to one-third the height of springform pan. Bake cheesecake about 1 hour 30 minutes, adding very hot water to larger pan as needed, until center is set. Meanwhile, in small bowl, stir flour, brown sugar, butter and cinnamon until crumbly. Stir in pecans. Set Crumb Topping aside. Sprinkle Topping over cheesecake. Bake about 30 minutes longer or until topping is set. Remove from pan of water. Cool cheesecake 30 minutes. Loosen side from pan; remove. Refrigerate uncovered 3 to 4 hours or until chilled. Store covered in refrigerator. Use 2 cups canned pumpkin instead of cooking and mashing the sweet potatoes. Serve this rich dessert on plates dusted with cinnamon. 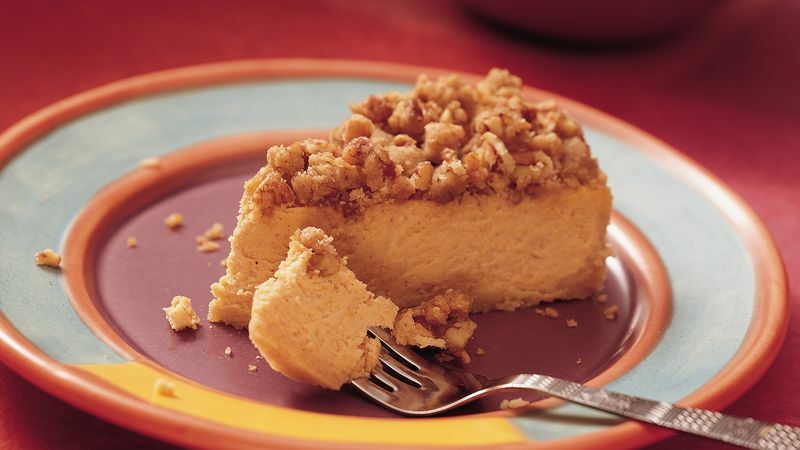 One of the earliest recipes for cheesecake appeared in a Philadelphia cookbook published during the 1850s. African-American caterers, well-known in the city for their culinary expertise, were very likely to have included their personal version of the cream cheese dessert on social event menus.